Researchers have found that an iron-containing mineral called dusty olivine, present in meteorites, retains a record of the magnetic field from the early solar system around 4.6 billion years ago. The results are surprising, as the magnetism in dusty olivine is non-uniform, and non-uniform magnetic materials have previously been thought to be poor magnetic recorders. The discovery may lead to new insight into how the solar system formed—with the help of magnetic fields—from a protoplanetary disk. The researchers, Jay Shah and coauthors from the UK, Germany, and Norway, have published a paper on the discovery of the oldest magnetic record in a recent issue of Nature Communications. "Our study shows that magnetic fields that were present during the birth of our solar system are credibly contained within meteorite samples that we have in our collections," Shah told Phys.org. "With a better understanding of these complex magnetization structures, we can access this magnetic field information, and deduce how our solar system evolved from a disk of dust to the planetary system we see today." In the field of paleomagnetism, the main objects of study are ancient rocks and other materials which, as they cooled during their formation, acquired a thermoremanent magnetization imparted by the magnetic fields present at the time. By studying these magnetic materials, researchers can find clues as to what kinds of magnetic fields existed in the early solar system. As the researchers explain in their paper, the underpinning hypothesis in paleomagnetism is Néel's single domain theory, which predicts that uniformly magnetized grains can retain their magnetic states over geological timescales. However, Néel's theory says nothing about non-uniformly magnetized grains, which are the most abundant form of magnetism present in rocks and meteorites. Although some research has suggested that non-uniform magnetization states do not retain their magnetization very well, the question has remained unanswered until now. The new study shows, for the first time, that iron with non-uniform magnetization states can retain magnetic recordings from more than 4 billion years ago. 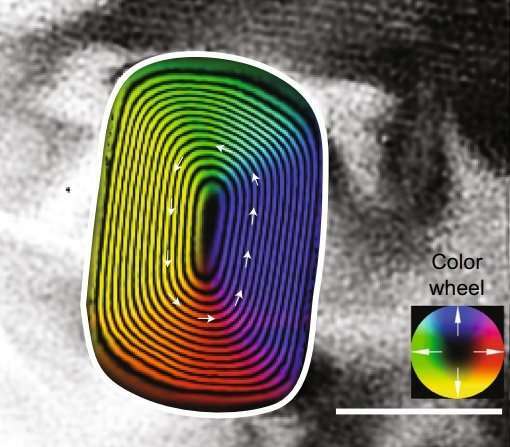 To show this, the researchers used cutting-edge imaging techniques (nanometric magnetic imaging and off-axis electron holography) to study the magnetic grains in dusty olivine, which are a few hundred nanometers in size. In tests, the researchers heated the grains above 300 °C, the highest temperature that these meteorites would have experienced since forming 4.6 billion years ago, and observed that the grains retain their magnetic states. As the thermal relaxation times at this temperature are longer than the age of the solar system, the results strongly indicate that the thermoremanent magnetization imparted during their formation has remained stable to the present day. The researchers expect that the results will lead to a better understanding of the magnetic field in the early solar system, and even how the solar system originated. "I hope that this study can drive a better understanding of complex magnetization structures that will result in more sophisticated analyses of ancient magnetic fields throughout the solar system, including those on Earth," Shah said. Interesting; Chondrules forming close to the sun retains the solar magnetic for 5billion years go on to form planets, with sufficient Chondrules their combined magnetic fields will exponentially expand and go towards planetsary magnetic fields, and they last for over 5billion years. The Sun theory of Chondrules from Nano Paleo Magnetism "dust particles being flash heated to 2000 K. caused these dust balls to melt, forming spherical droplets that cooled re crystallised into chondrules – the mm-sized rounded particles of chondritic meteorites (the building blocks of the Earth) - Chondrules formation can be constrained by measuring the intensity of the magnetic field that chondrules were exposed to as they crystallised and cooled. Some proposed mechanisms involve formation close to the early Sun, implying that chondrules would have been exposed to strong magnetic fields as they cooled https://wserv4.es.../?p=1094 "
Unfortunately it will NOT! The assumption that planets form from a protoplanetary disk all by itself is unsubstantiated and contrary to real life physics 101. This self-formation is hypothetical conjecture, unsupported by ANY real-life observation whatsoever. Furthermore, the mechanical makeup of planets and moons rails against such an idea, especially in the one most studied example we currently live on. There is just no explanation for how this planet got it's different parts and in particular that most enigmatic iron core. Yep, but he got an A+ in religious woo! Are you honestly trying to say that two objects with mass have never been observed to be pulled towards each other due to their gravity? Gravity and rotation out of the sum of random movement makes planetary disks and planets, this has been known for decades and is consistent with physics 101 - or the theory would not cut it. Which your non-alternative of unpublished, unsaid ideas do not, obviously for everyone else. "Furthermore, the mechanical makeup of planets and moons rails against such an idea, especially in the one most studied example we currently live on. There is just no explanation for how this planet got it's different parts and in particular that most enigmatic iron core." I am not sure what you mean by "mechanical makeup", but accretion heating and iron core formation has been the explanation for an even longer time. So drop your nonsense claim of 'no explanation', it hurts the eyes of those who do know to look it up in the nearest encyclopedia. The comment in sum: No curiosity asking and answering questions on a science site, which is its educational purpose. Just trolling insane claims.